As the year draws to an end, breweries often partake in the tradition making a special beer to offer in gratitude and thanks to friends and family. These beers tend to be a bit bigger, more brash, and complex than their normal offerings. However, it often feels like the modern world in which we live is already plenty big, brash, and complex. We decided to go down a different path for this beer. We wanted to make a beer of simplicity and elegance, equally at home being enjoyed after a long day of work, a fun day of skiing, or sitting around the dinner table with friends. It was with this in mind that we chose to rebrew a beer that our friends have been asking us to bring back since it ran out last winter. Crisp, clean, and delicious, we decided to bring back the beer that launched our lager program, Helles. To accompany this beer, we had to find the right name, which we did in Helles’ native tongue. 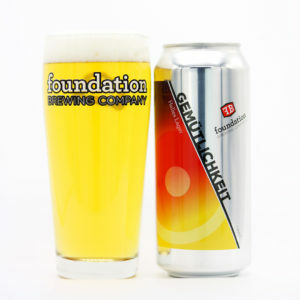 The German word Gemütlichkeit (/ɡəˈmo͞otlikˌkīt/) has no direct English equivalent, but it is best described as a feeling of warmth, contentment, and happiness, embodying what we hope to share in this beer. Thank you all, and we wish you Happy Holidays and a wonderful New Year.